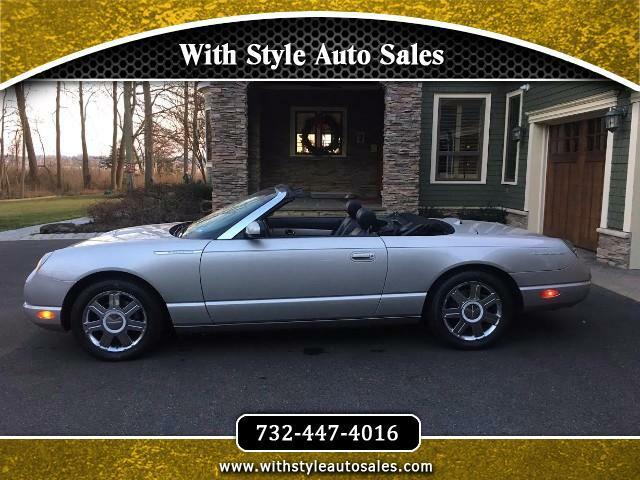 2005 FORD THUNDERBIRD 50TH ANNIVERSARY EDITION. CLEAN CARFAX - NO KNOWN ACCIDENTS , 2 OWNER CAR - ORIGINALLY WAS BOUGHT IN ARIZONA - NO RUST. 1855 REAL ORIGINAL MILES - YES ITS REAL !!!. I CAN GUARANTEE YOU WONT FIND ANOTHER 05 T-BIRD WITH THIS CRAZY / SUPER RARE / UNREAL LOW MILEAGE!!! CAR COMES WITH HARD TOP - GREAT CONDITION , STAND FOR HARD TOP AND SOFT TOP COVER.